The Spanish–American War occurs and the Philippine–American War begins. The Dreyfus affair is on-going. Great Britain rents Hong Kong for 99 years from China. The Hawaiian Islands. are annexed by the United States. Paul Gauguin, Pierre-Auguste Renoir, Henri Matisse are painting. H. G. Wells , L. Frank Baum, Jules Verne, and Arthur Conan Doyle are writing. Mount Rainier National Park is created in Washington state. Guglielmo Marconi succeeds in sending a radio signal across the English Channel. Max Planck announces his quantum hypothesis. In January 1901, Queen Victoria will die after reigning for over 63 years. 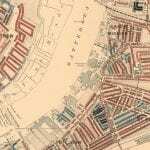 Charles Booth publishes demographic maps of London. It’s latter half of the nineteenth century. The late Victorian Era. The Age of Industrialization. It is a time of workhouses, prosperity, social reform and Jack the Ripper. In Europe, population totals had finally risen above pre-Plague numbers. As in much of Europe, many American and British cities were experiencing unprecedented jumps in population. Chicago, a major transportation hub, grew from less than 5,000 people in 1840 to over a million by 1900. And New York, a prime destination point for immigrants, with just over 500,000 people in 1850, by 1900, had jumped to almost 1 1/2 million. London, the center of the British Empire, went from 1.7 million people in 1831 to 4.7 million by the 1881 census. There were many causes behind this population shift. Some of the driving factors include famine in Ireland, political troubles in Europe and the changeover from traditional farming to industrialization. Whatever the cause, many unskilled laborers flowed into the cities. A middle class of shop keepers and professional occupations was emerging. The modern city was slowly being created. All maps have the goal of communicating information to their users. Many maps provide information on how to get from point A to point B. Others include information about flora, fauna and property records. In the late 19th century, the demographic map developed. A map created by Dr. John Snow , in 1854, was used to prove that cholera was waterborne. The Cholera map helped persuade London to clean up its water supplies and create sanitary sewers. Perhaps influenced by the Cholera map, social scientist Charles Booth with assistants began working on a detailed survey of London. They spent 17 years interviewing numerous people and with some exceptions, visited every street. Interview questions were wide ranging. They covered living and working conditions for men and women, migration, leisure and religious activities. Booth eventually published 17 volumes of “The Life and Labour of the People”. Along with sixteen of the volumes, Booth published a color coded map. Every street in London was given one of seven colors–Yellow was the prosperous upper class and Black for the semi-criminal lowest class. The colors in-between are sometimes difficult to tell apart, but can also indicate a blending of that area. Viewers were surprised by how close small pockets of the poor were to the large sections of wealthy or well-off. The largest concentration of the poor (35%) was in the East End. There, housing was overcrowded and wages were low, in part due to the great docks on the Thames. Booth’s map gave a fairly good estimate of status as well as wealth. London, at the turn of the 20th century, was very class conscious. Later, in the U.S. the redlining maps used the same kind of mapping technique. Redline maps were originally intended to predict good candidates for bank loans. But because they unfortunately indicated race as well as economic stability, these maps became tools of discrimination. Booth’s inquiry and subsequent mapping became a guide for future social scientists. Chicago’s Hull House created a deeper database by classifying income level on a house-to-house basis. Today’s Social Explorer, ESRI’s Living Atlas of the World and the U. S. Census Bureau’s American Community Survey are direct descendants of the cartographic endeavors of the 19th century.